The Northern Star marks the birth of South Australia's first country newspaper, earlier newspapers being the very short lived Port Lincoln Herald, and the German language Deutsche Post at Tanunda. The newspaper was printed and published by George Massey Allen, a disgruntled ex-Advertiser journalist who also ran an auctioneering business at Kapunda. The Star provides a fascinating insight into life in the area in the early 1860s, particularly in its uncensored comments about local people, which is a large part of its enduring value. The Star survived for three years before being forced to close due to the colourful and argumentative approach taken by its owner/editor. Geographical coverage The Star was the first title in a major flowering of the South Australian country press in the mid 1860s. Many of the other 1860s titles are still in existence today. As the forerunner in an unoccupied field, Allen's geographical coverage was broad, assisted by the infant telegraphic network. The newspaper included news items from as far away as Clare, Riverton, Angaston, Gawler and Burra, but the main focus was on Kapunda news and doings. Poetry Early issues of the Star included a 'Literature, poetry and fine arts' column, mostly consisting of poems. Most were copied from other sources, including the works of famous poets such as Tennyson. Local contributors included 'W.G.G.' of Kooringa and 'V.' of Kapunda. Another local poet was 'A.G.B.' or A.G. Ball of Kapunda, who wrote some interesting bush poems. (5 July 1862, p. 3 and 6 December 1862, p.3) 'F' of Gawler contributed a poem about the Rainbird tragedy. (6 April 1861, p. 2-3) Long serials by lesser English writers were also published in the Star. 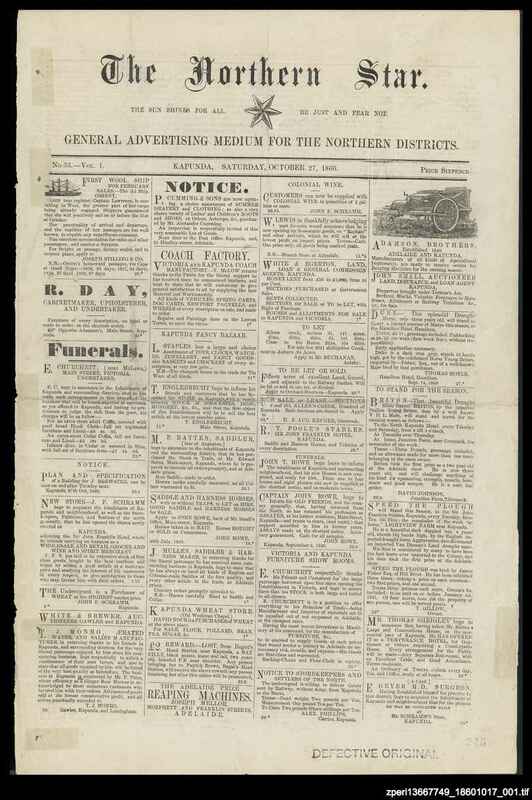 Advertisements As well as the front page, the Star initially contained three additional pages of advertisements, justifying its sub-title 'general advertising medium for the northern districts'. Many of these were for Adelaide businesses - in particular stationers, hotels and the National Bank. Seemingly Allen had managed to entice almost every business in Kapunda to advertise in his newspaper, as well as businesses from surrounding towns. Later he took the local barber and photographer, Fritz Unverhau, to court for non-payment of his advertising bill. (7 September 1861, p. 4) By mid 1861 the Star contained fewer advertisements, and almost none for Adelaide businesses. Other content Editorials suggest Allen's strong critical interest in South Australian parliament and politicians. He observed keenly the Royal Commission into the behaviour of Judge Benjamin Boothby, claiming the city newspapers were taking a biased anti-Boothby stance. (3 August 1861, p. 4) During the sitting of the Commission at the end of 1861, Allen included a special supplement to the Star, with detailed transcripts of the hearings. Early in the newspaper's existence there were many articles about the Snowy River goldfields in New South Wales, which were then attracting large numbers of South Australian hopefuls, perhaps dreaming of a repeat of the Victorian rush of 1852. Allen often reprinted divorce cases and similar 'scandalous' news from English and inter-state newspapers, which was perhaps in line with his crusades against local sexual miscreants rather than for the usual purpose of providing sensational reading. In 1867 Allen established the South Australian satirist newspaper in the city, possibly thinking he would have a larger audience there for his skills. This closed in 1868 when he was sent to jail for libel.